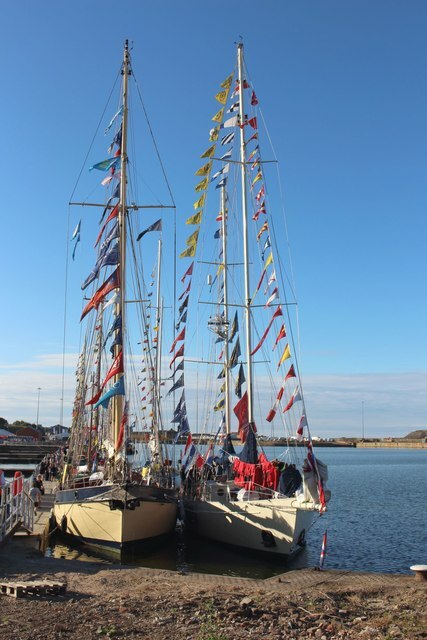 "The smaller ships taking part in the Tall Ships Races 2018 which were attending the start event hosted by Sunderland were lined up 2 abreast alongside temporary pontoons in Hudson Dock within the Port of Sunderland. For the occasion parts of the port normally off limits to the public were used to host the vessels, and opened up to the public to allow a close look at the competing ships. The ships nearest the camera are Sila Sibiri and Urania. " Photo by Graham Robson, 2018.